Jay and Miles Survive the Experience. my ultimate, ultimate favorite series ever is all new wolverine!! anyone reading this comic: please pick it up. It’s got sibling shenanigans! It’s got clone nonsense! It’s got trauma healing! It’s got so much good stuff! Read All New Wolverine Please. He also has zero self-preservation instinct, which is another point in favor of my jetpack theory. I was very lucky to stumble upon you guys so early in the process. Having just bought my first smartphone I searched the installed podcast app for my favorite thing. But the best part about the last few years with you has been the non-X-related stuff, from picking up phrases from you guys (Miles’ “I like liking stuff” to Rachel/Jay’s early and often use of “godamn delightful”) to being reminded of large chunks of my childhood like Voyage of the Mimi & Spider-Man & His Amazing Friends, to being exposed to your other interests like Thor and Silent Hill and Speed Racer. I’ve also really appreciated that even the loves we have in common – The Outback Eight and Scott Summers (my spirit animal) chief among them – are loved for completely different reasons. I travel from state to state, hours at a time alone for work and it’s good to have you guys there with me. I’m surprised you didn’t mention Secret Crisis on Infinite Podcasts amongst the highlights tho. It was such a unique concept and mind-broadening experience, even if it was more Acts of Vengeance-y in it’s crossoveryness. It directed me toward a lot of other podcasts to try, but honestly I didn’t stick with them long. The difference between you guys and most others I’ve tried is a combination of content prep and production quality. ESPECIALLY production quality. So to you and especially your producers… thank you for being such a huge part of my life even if I’ve been unable to return the favor. Here’s to many many half-decades more! Excelsior! When I first started listening to podcasts (which was something I did because my job was unbearable without some mental stimulation), a friend suggested I check out yours. I think you were at about 30 episodes at the time. Now, 4+ years later, I can safely say that you have ruined me for any less well-researched fancasts. Also, you have provided me with many hours of enjoyment, made me think about things I wouldn’t have otherwise, and even got me to go back and re-read things I would’ve told you five years ago that I’d probably never read again. So this podcast made me cry. AGAIN. I could write that I love the bits and recurring gags (and I do) and I could write how wonderfull it is to re-live old comics I only read in swedish (it is!) Bu the best thing about this podcast is the emotions. Everything from Miles enthusiasm and Jay’s dry wit, to making me cry re-listening to the “god loves, man kills” episode. Also, the community. A safe space to discuss things. Some people I am really happy that I now know. Thanks! And keep it up! You’ve been consistently interesting, entertaining, and have made me see old stories with a new appreciation which is all I can ask of a podcast. Thanks to all involved in the shows creation, and here’s to as many more years as you can manage without requiring some sort of counselling for “superheroic soap-opera” overexposure. This podcast was a consistent and wonderful part of some terrible, rough years I had. I’m glad is still here, and still awesome as always. Congratulations on being Very Young. Soon you will be Six. I’ve listened to most of the episodes at least twice. When I have some major project (moving, driving across the continent, IKEA, anything like that) I load up a bunch of older episodes, skipping interviews — because while interviews with other people are nice and all, I’m basically here for Jay and Miles and their views on the X-Men. I’ll second Kelvin’s thought that you might have mentioned Secret Convergence on Infinite Podcasts, which must have been this spreadsheetabulous logistical nightmare to execute so flawlessly. But what really impresses me, maybe the most, is how enthusiastic about and engaged with this material you manage to be, every single episode. I imagine that, seeing as you are human beings, there must have been days when reading something and making notes for the podcast felt like a chore, but even when you say that what you’re covering isn’t good, you still always to find something interesting to observe about it. Add to your list of fan favorites episodes 35, especially its coverage of Dazzler the movie, and episode 62, the Giant-sized with the Australia era rpg. Both are loads of fun. However, I’m sure my true favorite hasn’t been recorded yet. Phalanx was my first event. We’re about to hit JoeMad, who I was sure had to be one of the coolest people within 5 years of me. I love that you both kept this up through life’s changes. Not doing so would have been a totally legitimate personal choice, but I’ll be bummed out when the day comes. 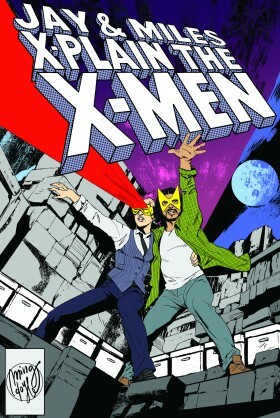 I feel like I’ve learned a lot from the show, and most important bits aren’t really about the X-Men. They’re about people. A couple months ago, my favorite show was celebrating its 100th episode, and midway through announced that it was also its last. The Wednesday Club had been my port in a storm largely because of its carefully cultivated community. I think I’ve been cuddling down here a little harder since then. I appreciate that extra step so much. You actually haven’t gotten even close my favorite X-Men yet. I’m a huge fan of the Messiah trilogy/SF era. I love the Cyclops/Emma relationship then, one of the only times the mutant metaphor feels updated for modern times, Magneto and Namor as Cyclops’ henchmen, and Dad Cable! Also Rogue-centric Legacy, the incredible artwork of the 2008 X-Force, Vampire Jubilee… I’m really looking forward to hearing your take on this stuff. You know, in 2027. I actually only started getting into comics at all around the first dozen or so episodes of your podcast, so you’ve been a constant companion as I’ve basically binged as much X-Men as I could get a hold of. Thanks for five incredible years! Thank you for 5 amazing years of consistent amazing content creating and being a safe and comfort zone for hundreds of people (including me). Thank you for being so great and setting such a good example for positivity, constructive thinking, empathy, generosity, solidarity and overall friendliness. Thank you for being yourself and teaching me how to grow as a human being. Thank you for creating a place of gathering for a community of such amazing people like the listeners of the podcast, which are another miracle by themselves. Thank you for everything, dear Jay and Miles!